Grandma’s baking sheet was well used. We loved to get cookies baked on it because of the star pattern would be on the bottom of the homemade cookies. It still serves that purpose on occasion, but mostly it is used as a liner for casseroles such as lasagna, so the bubbling liquid doesn’t spill onto the oven’s floor. 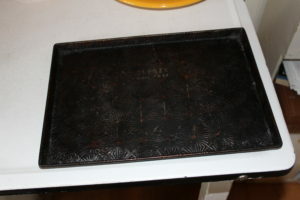 Grandma O’s Ovenex sheet pan. 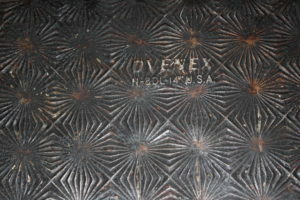 Close up of Ovenex label and the star design on the baking sheet pan.